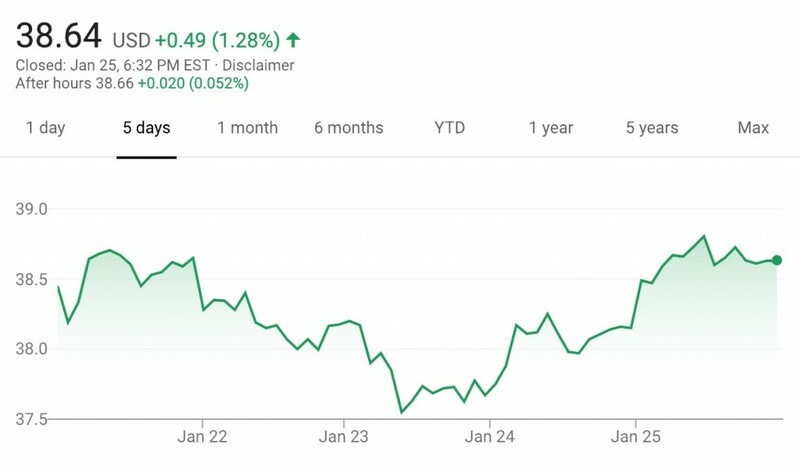 The value of GM stock remained steady during the January 21st, 2019 – January 25th, 2019 timeframe, closing the week at $38.64 per share, which is $0.33 higher compared to when it first opened the week at $38.48. This marks the third consecutive week during which GM stock saw an increase in value. This week, the boost came on the heels of the Detroit Auto Show, where GM unveiled the Cadillac XT6 crossover SUV and pre-announced an electric Cadillac crossover. We also believe that the investors conference held by GM prior to the start of the Detroit auto show was also a notable factor in the ongoing rally for its stock. During the conference, the automaker outlined several future Cadillac vehicles and how they will contribute to its bottom line. Finally, we believe that the impending end to the governmental shutdown stifled GM share growth during the week. Over the last few years, GM has taken significant steps to increase the value of its stock, including exiting markets where it is unwilling or simply can’t figure out how to turn a profit (such as Europe, South Africa and India), closing plants in various parts of the world, divesting loss-making divisions (such as Opel-Vauxhall), making adjustments to its business model in order to prioritize profit over market share, focusing on the profit potential of its Cadillac luxury vehicles brand, and investing heavily into new-age mobility ventures such as electric vehicles and autonomous driving tech. Despite these notable moves, the value of GM stock has remained close to the $33 per share value of the “New GM’s” Initial Public Offering (IPO) in November 2010 on the NYSE, a circumstance that has had many an investor frustrated. However, the rally experienced during the past several weeks marks a very positive development. Stay tuned to GM Authority for ongoing GM stock news and complete GM news coverage. Where are the boo birds here? Artificial means of propping up stock price through buybacks and dividends at the expense of product and capital investment can only go so far. When people wake up to this, expect GM stock to be well below $20 a share- probably within the next 18 months.